Industrial varieties: most manufacturers are absent on the free market and run on their contracts and previously purchased volumes. The offer is more pressing than last week, especially for the Bintje. We observe some export to Eastern countries, Spain, and northern Africa. Very few transactions observed on a hesitant market due to the lower Belgapom prices from last Friday. Bintje: “friable quality”: max 15% floating at 1,060 g/l and PSE min 335 g/5 kg: 18.00 to 22.00 €/q, depending on quality and destination, calm market. 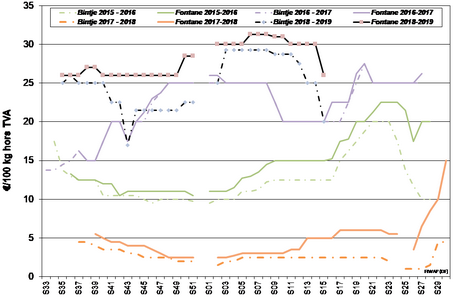 Bintje plant: Dutch plant, class A, returned April 2019, by 5 tons, in bags, hTVA: little trade, prices still going down. 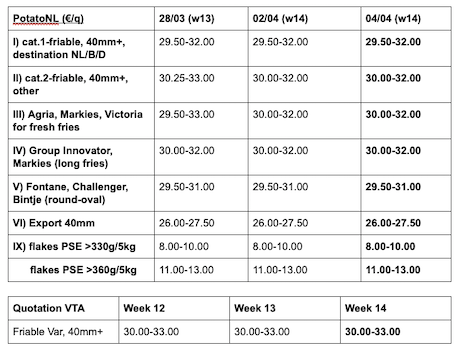 Stable prices last week in the Netherlands, between 29.50 and 33.00 €/qt in direct delivery for the industry (Innovator, Fontane, Challenger or Agria), with the highest prices for Agria. The sudden and unexpected Belgapom price drop last Friday pushed back the forward market. 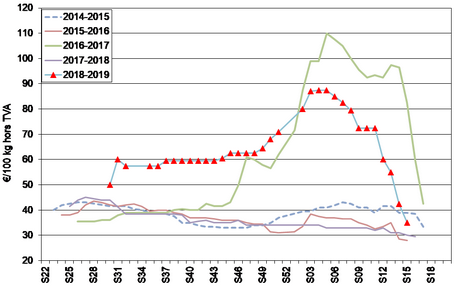 Time will tell how the Dutch industries will integrate this evolution, but chances are high that they will slow down...No evolution on the export market, with shipments to Eastern countries and Africa, on a basis of 27 to 32 €/q (departure in bags). For the industry, there is almost no demand for immediate delivery, but prices are not really evolving anymore. The export market remains firm in prices, but less dynamic in volumes. The activity comes mainly from Eastern countries (EU and non-EU), and we feel the end of the season with the gradual depletion of the stocks. 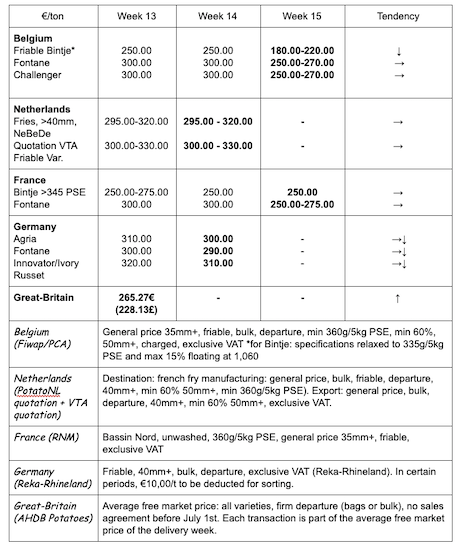 Producer price from 32-35 €/q for basic varieties (calibrated big-bag), to 40 €/q for the nicest Agata. On the fresh market (Rhineland), on April 5th, prices were stable for firm flesh at 40 €/q for the storage output refrigerated crates, and for soft flesh at 38 €/q for storage output refrigerated crates. 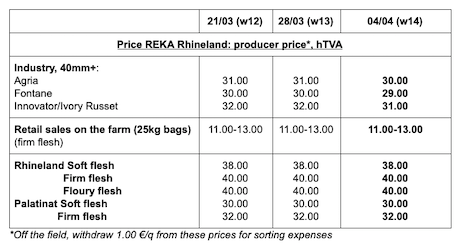 For the firm flesh sold at the farm (Rhineland), firm prices between 11 and 13 € per 25 kg bag (slight increase). Average producer price (all markets) week 13: 26.53 €/q (compared to 25.80 €/q in week 12). 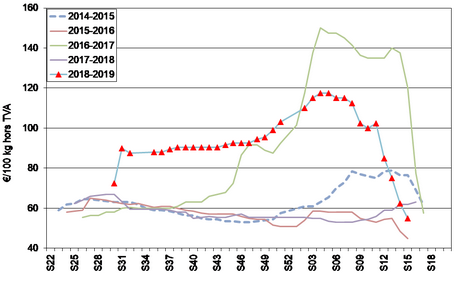 The domestic market in bags (retail) is calm, with prices remaining firm for the now rare superior quality. The offer for lower qualities is increasing. The wholesale market is even considered “unusually calm” with prices varying widely depending on the caliber and variety. Good stocks for cooking with a decent caliber are rare and it should be the case until the end of the season. Very little free trade for the industry, on a basis of 35.00 €/q for Markies good for cooking. We still observe some export of large caliber seedlings to Belgian factories, in the Hermes and Atlantic varieties.